It was deja vu once again. Though they dished out a vastly improved display against Mumbai Indians in their last match and stretched the in-form team to the hilt, the end result was the same. Sourav Ganguly led from the front with a blazing 54-ball 88 as a resurgent Kolkata Knight Riders bulldozed a hapless Deccan Chargers by 24 runs in their return-leg Indian Premier League match here today. Kumar Sangakkara dismissed outright the talk of lack of unity or negative vibes among players as the reasons for the dismal performance of Kings XI Punjab in the ongoing IPL. Senior Indian forwards Prabhjot Singh and Deepak Thakur were today dropped from the list of 45 probables selected to attend the coaching camp at Balewadi Sports Complex in Pune for the 19th Sultan Azlan Shah Cup International hockey tournament in Malaysia. A six-member selection committee met here today and finalised the list of players which includes six goalkeepers, seven fullbacks, 16 mid-fielders and as many forwards. Pakistan may want Sania Mirza to play for them after marrying cricketer Shoaib Malik but the tennis ace remains committed to representing India, the All India Tennis association said here today. Arsenal withstood an onslaught from Barcelona to salvage a 2-2 draw and keep alive hopes of beating the defending champion to a spot in the Champions League semifinals, while Inter Milan has the edge over CSKA Moscow after a 1-0 win. It was deja vu once again. Though they dished out a vastly improved display against Mumbai Indians in their last match and stretched the in-form team to the hilt, the end result was the same. Six defeats out of seven matches they have played so far and survival hopes hanging by a thread, the Kings XI Punjab face an uphill task when they square off with Royal Challengers Bangalore in the crucial day-night IPL match at the Punjab Cricket Association Stadium here tomorrow. “From now on we need to win every game we play. Unfortunately, we have put ourselves in a position where we are now fighting with our backs to the wall,” Kumar Sangakkara, skipper, observed on the eve of the match today, adding, however, that the players were focused on the job at hand. Playing on the home turf, Kings XI Punjab would be pinning hopes on Australian opener Shaun Marsh, who struck a brisk 47-ball 57 in his first IPL III match against Mumbai Indians a couple of days ago. It was an irresistible Marsh who was largely responsible for taking Kings XI to the semifinal in the inaugural edition of the IPL in 2008. And Marsh striking form in his very first outing of the season must be gratifying for the hosts. Even if Sangakkara looked unperturbed about the continuing indifferent patch of Yuvraj, the local hero and the team icon player must get back to his scoring ways. With 100 runs in seven outings (14.46 average), Yuvraj has been a pale shadow of his former self. In fact, it has been the collective failure of middle order that has put them in such a precarious situation. If Yuvraj has been guilty of non-performance, Sangakkara and Mahela Jayawardene have not fared better either. While Jayawardene tallies nearly the same total as Yuvraj, Sangakkara has yet to play a knock of consequence. Kings XI players look vulnerable even on the bowling front. While Sreesanth blowing hot and cold, which led to his axing from the 15-member squad, Brett Lee, the pace spearhead, has failed to strike the rhythm which can make him such a lethal bowler. Left-handed seamer Shalabh Srivastava and Vikramjeet Malik have, at best, been steady. With a 4-3 win-loss ratio, Royal Challengers Bangalore are comfortably placed. The induction of hard-hitting England batsman Kevin Pietersen is going to strengthen the batting line-up even further. With the preliminary games set to be over and the IPL interestingly poised, Pietersen will be awaiting eagerly to take the field and make his presence felt. Anil Kumble-led Royal Challengers do not have many problems to contend with. With veteran Jacques Kallis emerging among the top run-getters in the IPL and the likes of Robin Uthappa, Pietersen, Ross Taylor, Virat Kohli and Manish Pandey to follow, their batting line-up looks intimidating. In fiery Dale Steyn and wily Praveen Kumar, Bangalore have perhaps the most formidable new-ball combination. With skipper Kumble bowling with nagging accuracy that has made him the most economical bowler in the competition so far and seamer Vinay Kumar teasing batsmen with his change of pace and variations, batting can be a tough proposition for any team. 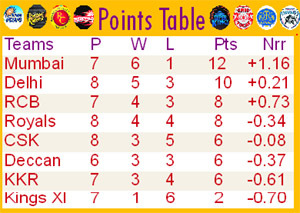 With their backs to the wall, one only expects Kings XI to go all before it is too late! Ganguly blasted nine fours and five sixes and added 78 runs for the fourth wicket with David Hussey to take the Kolkata Knight Riders to a competitive 181 for six at the Eden Gardens here. The home team then returned to restrict the defending champions to 157 for five to zoom to the fifth place, just behind Rajasthan Royals with eight points from eight matches in the points table. Barring offie Mohnish Parmar, the KKR bolwers put up a disciplined performance with Shane Bond, Angelo Matthews, Murali Kartik, Ajit Agarkar and Chris Gayle taking one wicket each to contribute to their team's win. Chasing the tall 182, opener Herschelle Gibbs hit 50 from 45 balls including a six and gave KKR a run for their money before Shane Bond evicted the South African to script the turn around. Andrew Symonds hit a 37 ball 45 but 34 runs from the last over proved to be a bit too much for the Chargers who had lost their opening match to the Knights earlier. Opting to bat, Ganguly set his home ground on fire with his fireworks. The ace southpaw stood tall among the ruins of Chris Gayle (4), Cheteshwar Pujara (17) and Manoj Tiwary (5). David Hussey gave a fine support to Ganguly at the other end with a 27-ball 31 that included one four and two sixes. Fall of wickets: 1-15, 2-46, 3-68, 4-146, 5-159, 6-163. Bowling: Roach 4-0-48-0, Jaskaran 3-0-18-2, Symonds 4-0-26-2, Harmeet 2-0-21-0, Rohit 2-0-16-0, Ojha 4-0-38-2, Rao 1-0-10-0. Fall of wickets: 1-31, 2-77, 3-121, 4-125, 5-151. Bowling: Parmar 3-0-33-0, Bond 4-0-28-1, Agarkar 4-0-31-1, Kartik 4-0-29-1, Mathews 4-0-25-1, Gayle 1-0-9-1. The Kings XI have been going through a lean patch that has seen them lose six of the seven matches they have played in the IPL so far. The lone game they won was against Chennai Super Kings. That was when South Africa seamer Juan Theron dealt two crucial blows in the Super Over, getting rid of dangerous Matthew Hayden and Suresh Raina in quick succession to pave the way for a come-from-behind win for Kings XI. “Most of these stories come out when the team is losing and not when it is doing well. There is no rift in the team. Guys are a bit disappointed on account of poor performance. But there is a keen desire to do well,” Sangakkara, who will take over the leadership mantle tomorrow after serving a one-match suspension in the last match because of the team’s failure to maintain the rate of overs in the previous. “People perhaps are not aware that he is coming back from injury. He hasn’t had proper preparation before coming into the competition,” the Sri Lanka skipper said. “There are bound to be periods when a player is going through an excellent patch. Also, there are going to be days when his form goes terribly wrong. There are pressure cooker-like situations. There is no time for rest and you have one game coming after the other,” Sangakkara quipped. “Everybody wants Yuvraj to do well in every game. People forget that it takes just one good delivery or a one smart piece of fielding that can cause the downfall of a batsman,” said Sangakkara. “Yuvraj is a positive character. It is this lifestyle that has contributed a lot for the numerous victories for his country,” said Sangakkara. The camp, starting April 13, will continue till the departure of the Indian team for the Azlan Shah Cup starting at Ipoh, Malaysia on May 6. Today’s meeting was attended by Col Balbir Singh, Munneer Sait, B P Govinda and Sita Mehta (selectors) and Ajitpal Singh and Zafar Iqbal (govt observers). “Sania Mirza and her parents have informed AITA that she will continue to play for India after her marriage with Shoaib Malik. She has confirmed to be part of the Indian team in the 2010 Commonwealth Games at Delhi, Asian Games in Guangzhou, China, the 2011 Fed Cup and the 2012 Olympics at London,” AITA Secretary General Anil Khanna said in a statement. The statement came after Pakistan Tennis Federation chief Dilawar Abbas said he hoped to see Sania play for Pakistan after marrying Shoaib later this month. Sania, however, had already made it clear that she intends to continue playing for India even after tying the knot on April 15 in Hyderabad. “It is great news for our tennis community that Sania Mirza is getting married to Shoaib Malik. We welcome her and hope that she would become a Pakistani national and play for us in future. She has a great future ahead and we would be delighted if she plays for Pakistan,” Abbas told The News’. “Asian women traditionally follow their husbands which is why I’m hopeful that someday she would be inspired by Shoaib to play for Pakistan,” he added. 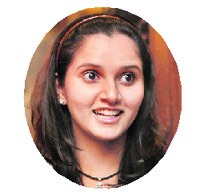 The 23-year-old Sania, who is the most successful woman tennis player from the sub-continent, will settle down with Shoaib in Dubai post marriage. Abbas said even if she decides to continue playing for India, Sania can still help her husband's country by promoting the game among women here. 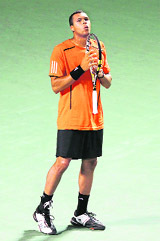 “She can encourage our girls to take up tennis, she can inspire them to become world class players,” he said. Barcelona comprehensively outplayed Arsenal for the first hour at Emirates Stadium and led through two goals by Zlatan Ibrahimovic before substitute Theo Walcott got a goal back in the 66th and Cesc Fabregas equalised in the 85th with a penalty yesterday. Fabregas picked up a yellow card for fouling Sergio Busquets but his suspension for next week’s second-leg match at Camp Nou is effectively meaningless after he sustained a suspected broken leg in the foul that led to the penalty. Barcelona captain Carles Puyol was sent off for his part in the innocuous tangle of legs in the area and will also be suspended. Barcelona, which beat Arsenal 2-1 to win the 2006 final, is still favourite to advance after scoring two crucial away goals. The Spanish side enjoyed a remarkable 74 percent possession in the first 20 minutes and 62 percent overall against a team widely recognised as the best passing unit in England. “It was art, I believe,” Arsenal coach Arsene Wenger said. Barcelona had 11 efforts at goal before Arsenal mustered a first in the 23rd minute, with Almunia saving from world player of the year Lionel Messi, Ibrahimovic and Busquets. “We came away from our place and played our style of football,” Barcelona coach Pep Guardiola said.